The Wolfman grabs Mr. Furious by the throat and rears back to punch him when it notices the ring on the hero’s finger. The monster utters a phrase in an indecipherable language, drops Furious and runs off. Furious explains that it’s a Mason’s ring – and the Wolfman had one just like it! Just then, Colonel Blade, Professor Daub, Mike and Raph arrive. Zeke’s spots the Wolfman on the next level of the building and it immediately runs off again. Back at the plane, Bondoman, the Spleen and Mystic Hand have taken cover inside the plane to escape the ghosts. The Spleen gets tired of watching the spirits and fires a machine gun at them – the bullets have no affect, but the apparitions begin shooting bursts of ice onto the craft. The three Mystery Men decide that the plane is too dangerous and flee towards the jungle. Bondoman is hit in the leg by an icy blast. The hero manages to chip it off and the three escape while the ghosts cover the plane in ice. Back at Botaquaxal, weird music begins to play. The Wolfman appears and begins to dance – in an effort to communicate like bees do. 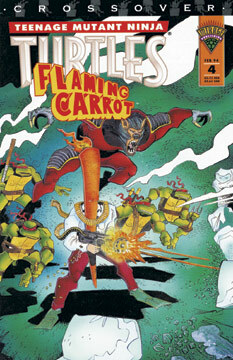 Flaming Carrot decides that he wants to boogie too, so he begins to dance – which enrages the Wolfman. Leo, Don, Screwball and the sentient Green Fire arrive – fortunatey the Green Fire speaks the same language as the Wolfman and a long conversation between the alien creatures begins. After some discussion, the Wolfman picks up the Green Fire and devours it. Everyone aims their weapons at the Wolfman, but he backs off and Blade orders the group to stand down and go outside. The Wolfman goes into convulsions and passes out, vomiting a pile of green goop. Outside, Star Shark informs the others that he heard gunfire by the airplane. The crew head out to investigate, as something watches them from the jungle. Our heroes find the Mystery Men’s craft completely encased in strange ice. As the team decides on their next move, the Wolfman arrives. Mr. Furious attacks him, and after a brief struggle, the Wolfman commands him to stop – he’s now able to speak English (thanks to eating the Green Fire). The Wolfman’s name is Chontre Mac, and he explains that inside the sun are numerous lands and races. Two thousand years ago some of the aliens had come here and established a colony. Eventually a civil war erupted and it brought about the death of 90% of the population. Botaquaxal is actually an outpost of that alien colony, set up as a final refuge that Chontre Mac entered and sank into the earth so the old culture and technology could be preserved. The wolfman is excited to see that the city has risen, as it signifies that the great evil has been defeated and a new age of prosperity is dawning for the people of Earth and sun. Suddenly the disembodied hands of Mystic Hand arrive and beckon the group to follow. Our heroes discover Mystic Hand and Bondoman encased in the alien ice. Nearby, the Spleen is laying unconscious by a tree. Furious awakens the cowardly Mystery Man and he tells the story of the ghosts and their ice blasts. Chontre Mac is shocked and states that he was wrong – only the Eikers could do such a thing – thus evil is still in power. Chontre explains that the Eikers will be beaming down their allies soon via a particle beam – the static that is growing is no doubt the creatures preparing to do just that. If they’re not stopped, thousands of ghostly villains will invade the Earth and destroy it. Chontre insists that he must sink Botaquaxal once again to prevent the Eikers from arriving. As the team prepares to leave, five Eikers arrive and a battle ensues. With a larger force available, our heroes quickly win the fight and make their way to the ancient city. Everyone escapes from the structure and watch as it sinks once again into the ocean. As the smoke clears the air, Colonel Blade salutes the memory of Professor Daub.